A thrilling post-apocalyptic tale of one man’s desperate race against time to find his family became a self-publishing phenomenon for London-based author Adrian J Walker in 2014. The stunningly original and gripping novel about hope and hopelessness, love and endurance in a United Kingdom devastated by catastrophic multiple asteroid strikes received hundreds of five-star reviews online and won Walker a deal with Del Rey Books, part of the giant Penguin Random House publishing group. Haunting, harrowing and with a pace as relentless as the horrors that face an overweight, idle, disconnected father-of-two crossing the length of the country to find the wife and children he has suddenly realised he is in danger of losing forever, The End of the World Running Club gives readers a brilliant new slant on the regular dystopian thriller. At the age of 35, Englishman Edgar (Ed) Hill is caught in his own headlock. He eats too much, drinks too much and is a full-time employee of a large, self-serving corporation in Edinburgh. He loves his wife Beth and two young children, Alice and Arthur, but knows he’s a half-hearted father just going through the motions of parenthood. Depressed and bored, Ed admits to himself that he is ‘like a man on a cliff edge, nodding off.’ And nodding off is exactly what he is doing when news breaks on TV that asteroids are hitting the UK, reducing the country to a ruined wasteland. 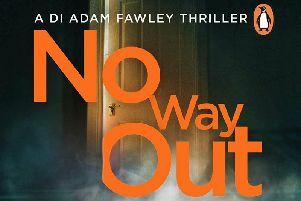 After holing up in their cellar to stay alive, Ed and his family, along with other survivors, find refuge in an Edinburgh army barracks where the military run operations and their lives settle into some sort of routine. But when he returns to the barracks after a salvage mission in the city, Ed finds his family gone, taken by helicopter to Cornwall for sea evacuation by an international task force. To reach them before they leave, Ed faces a gruelling 550-mile journey on foot across a devastated country. Ed’s treacherous journey through a broken landscape and a country peopled only by desperate survivors encompasses every human emotion and frailty… from fear, hope and loyalty to anarchy, aggression and self-interest. At the heart of the story are Ed and his ragtag team of fellow survivors, each from very different backgrounds, but each reduced to one single ambition… to achieve the seemingly impossible and reach the boats that are their only hope of survival. Devoid of the classic apocalyptic tale’s almost regulation super heroics, Walker’s brilliant novel instead concentrates on a cleverly observed exploration of human beings driven to the brink of total despair. Packed with nail-biting suspense, leavened by pathos and laced with dark humour, The End of the World Running Club will have readers hooked from first page to last.